Getting from Phoenix Sky Harbor International Airport to downtown is a breeze. Sky Harbor is four miles from the city center, and the typical cab fare is $15-20. A one-way ticket downtown aboard Valley Metro Light Rail is $2. 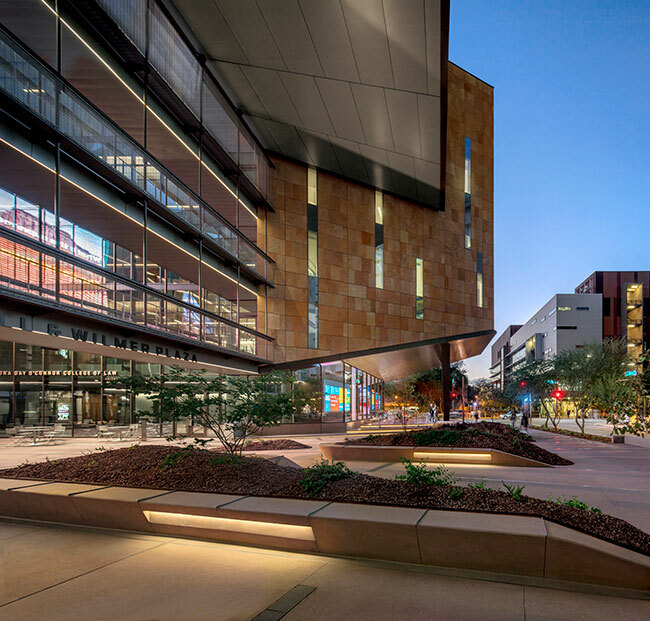 The Beus Center for Law and Society building brings the Sandra Day O’Connor College of Law from Tempe, where it was located for nearly 50 years, to the Downtown Phoenix campus, and closer to the courts and the city’s legal district. In addition to the law college, the BCLS building houses the Ross-Blakley Law Library, a bookstore and a cafe, and includes space for two think tanks, several cross-disciplinary centers and the ASU Alumni Law Group, the nation’s first non-profit, privately- financed teaching law firm. The hotels downtown generally do not provide shuttle service around the city of Phoenix. Public Transportation is available via: Taxis, Uber, and Lyft. Some hotels may have car rental available on site.